"This is a cream pie; served cold, but with the spices and fruit of a winter dessert." Combine raisins, white sugar, spices, sour cream, eggs, and butter or margarine in saucepan. Bring mixture to a boil, and reduce heat. Cook until thick, stirring constantly. Set aside to cool. 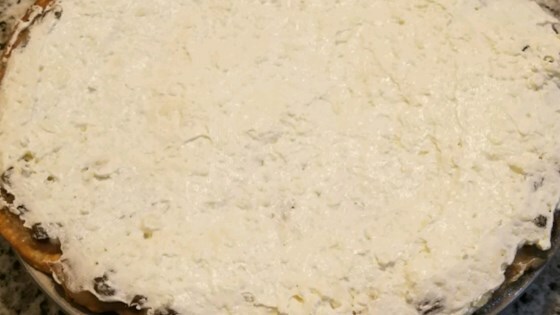 Blend cream cheese and confectioners' sugar together. Fold in 2 cups whipped topping. Spread half of cream cheese mixture on bottom of baked and cooled pie shell. Cover with cooled raisin mixture, and top with remaining cream cheese mixture. Spread additional whipped topping on top of pie. Refrigerate. WOW, was this good. Very easy and delicous. Will make this one for along time to come. Thanks Kitty. Delicious! Very rich, can only eat small portions at a time, but that didn't stop me from eating it. This is really delish! It is sweet & rich though- a little slice goes a long way. Numma numma numma!! !